HOTEL WAIKIKI: Big News: The Simpsons celebrates its 20th anniversary today. 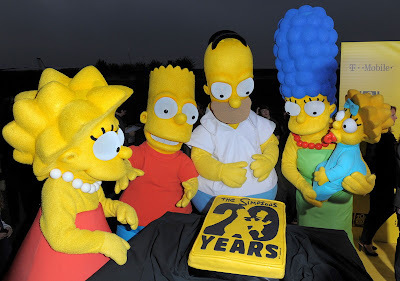 Big News: The Simpsons celebrates its 20th anniversary today. da Ohana....and would you believe it, the longest-running prime time entertainment TV show in America. My best friend Aimee used to nanny for Matt Groening's kids when they'd visit Kaua'i. Did you know that Matt Groening's kid's name is Homer? Seriously. It's Homer. Cloudia- 20-years went by fast. Ann- did Groening fashion Lisa in the image of your friend Aimee? LOL. Rowena- Homer's kids never grew older somehow. Random thought....how about the screen writers behind the scene. Anyone watch Futurama? It's coming back in 2010!!! Ann- Futurama? I had to look that up.